FREE exclusively for FABA and FAAR members! Registration closes Friday, Feb. 22, 2019. When will the next recession hit? What trends are driving consumer behavior? How is a lack of inventory impacting our market? 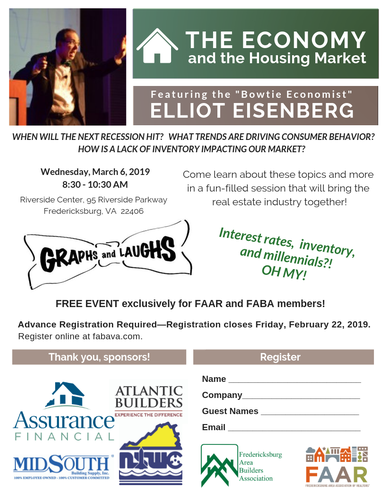 Come learn about these topics and more in a fun-filled session that will bring the home building and real estate industry together with a humorous take on the 2019 economic outlook. Elliot will speak on the condition of the overall economy with an emphasis on the four components of GDP growth, labor market conditions, wage growth, household wealth, inflation and interest rates. He will also present an update on the loacl housing market including residential construction activity, existing sales activity, home prices, home sizes, credit availability, household formation, demographics, Millennials, the timing of the next recession, and much more. He will also briefly compare economic conditions in Virginia to conditions in the other states and compare the Fredericksburg economy to that of other cities in Virginia.